Oriental Dragon Stiletto Folding Knife | BUDK.com - Knives & Swords At The Lowest Prices! Each stiletto features a 3" stainless steel blade with a razor sharp point. Each handle features a laser brushed design with a lacquer finish and stainless steel bolsters and guards. 7" overall. 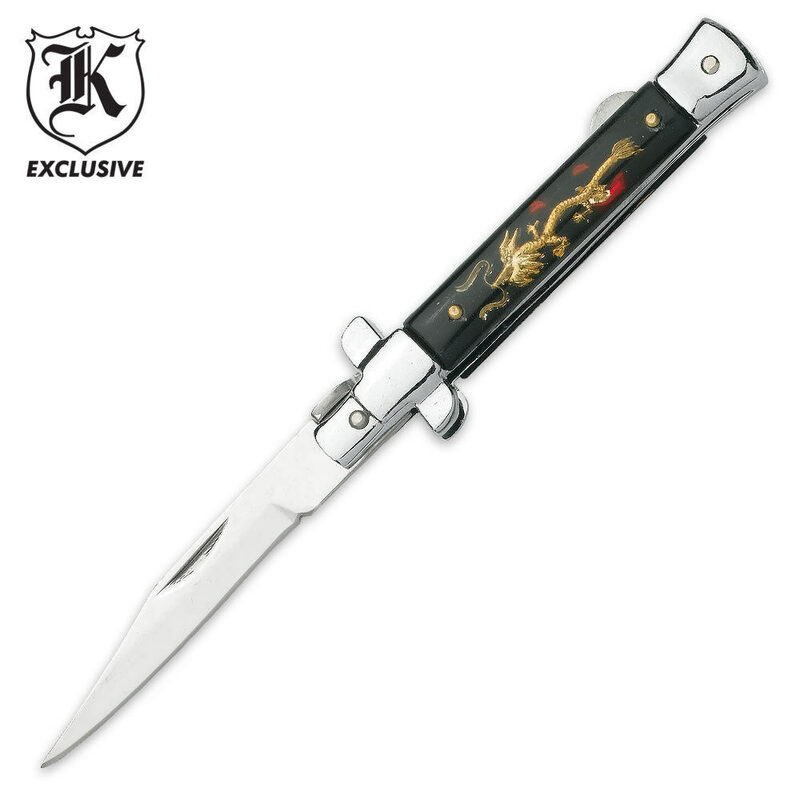 I have been very satisfied with Bud K's more expensive stiletto knives but was a little disappointed with this one. I had to file/stone in the locking mechanism but once I did that it locked up tight. The blade was reasonably sharp but there were "gaps" between the steel frame and handles. When holding it up to a light the light shone through on both sides. Hey, for $2.98 I am not complaining and the knife is good for a nice size pocket knife that should work just fine for cutting open packages, cutting string, and for normal every day use. This knife is great for the price indicated. Its not the sharpest nor the biggest yet it serves most utility needs and it offers a reasonable amount of protection. This knife should cost over $7 but is offered here for an extremely low price. I recommend that you buy this knife along with one of the higher quality stilettos, you'll find out there isn't too much of a difference. This is my BEST Stiletto that I own. I would advise anyone to buy more than One. Over all I give it a rating of Five Stars. Editor's Note: Thank you for your comments. We have updated the review to reflect the appropriate spelling.